Will Eno is a hot playwright these days, with two recent productions in San Francisco. First, there was the much admired staging of “The Realistic Joneses” at A.C.T., and now CustomMade’s west coast premiere of “Middletown” has been extended through April 30th. As it should be. Eno’s absurdist play turns Thornton Wilder’s beloved classic, “Our Town,” right on its head. “Our Town,” produced by high schools throughout the U.S. in treacly, sentimental renditions that can’t destroy its basic soundness, is an undoubted classic, even a masterpiece. But it is often misunderstood. Typically, “Our Town” is presented as a rather sentimental depiction of American small time life, full of gentle humor and loving memories. Critics, however, have recognized a much darker core, dealing with death, and prejudice, indifference, and sorrow. What Eno has done, brilliantly and hilariously, is take that dark core of “Our Town,” and placed it on top of, rather than beneath the surface of the story, and then proceed to make absurd fun of the horror. There is no police brutality, for example, in Wilder’s classic. And, if there were, it wouldn’t be as funny as it is here. 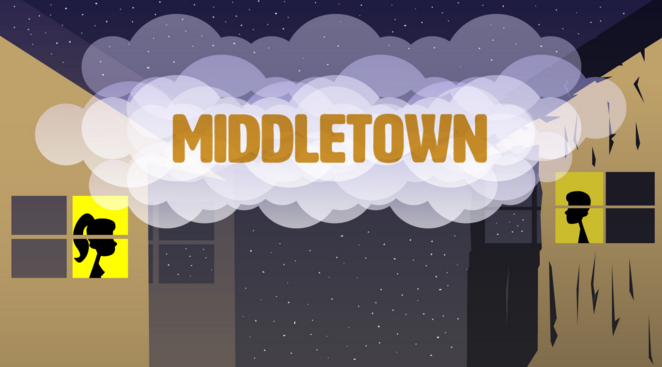 “Middletown” opens with a sendup of the famous stage manager’s monologue that begins “Our Town.” It starts simply enough with a brief description of the town and its residents, but continues to the point of silliness, going on and on into the most minute details. It simultaneously illuminates and ridicules the original. This combination of illumination and ridicule is the heart of the play and it works wonderfully well as more and more of “Middletown” (and “Our Town”) is revealed. Director Brian Katz seems to know just how to handle this material, and a fine cast delivers. At the heart of the play is a romance between Mary Swanson (Cary Cronholm Rose) and John Dodge (Fred Pitts). The two actors excel in playing the absurdist elements of Eno’s dialogue, while keeping the love story alive. Also outstanding is Justin Gilman as a confused, disoriented, wheel-chair bound mechanic, whose character harbors a surprising and unexpected secret talent revealed only near the end of the play. “Middletown” continues its extended run at the CustomMade Theatre through April 30th. For further information, click here. “Middletown” by Will Eno, presented by CustomMade Theater. Director: Brian Katz. Scenic Design: Sarah Phykitt. Costume Design: Brooke Jennings. Lighting Design: Maxx Kurzunski. Sound Design: Ryan Lee Short. Properties Design: Cat Howser. Video Design: Sarah Phykitt. Original Score: Rona Siddiqui. Choreography: Kim Saunders. Fight Choreography: Jon Bailey. Public Speaker/Astronaut/Doctor: Malcolm Rodgers. Mechanic: Justice Gillman. Cop: Ted Zoldan. Librarian: Jean Forsman. Mary Swanson: Cary Cronholm Rose. John Dodge: Fred Pitts. Tour Guide/Attendant: Jessica Jade Rudholm. Tourist/Woman on Date/Attendant: Ashley Cowan. Tourist/Freelancer/Radio Voice: Neil Higgins. Ground Control/Man on Date/Landscaper: Rowan Rivers. Aunt/Doctor: Catherine “Cat” Luedtke. Sweetheart: Gabriella Jarvie. Posted in Reviews.Tagged brian katz, Charles Kruger, Custommade Theater, Middletown, san francisco bay area theatre reviews, theatrestorm, Will Eno.